Above: A group of travellers in a horse-drawn carriage cross Derbyshire Bridge on their way north through the Errwood Estate. The photo probably dates to around the end of the 19th century. This narrow road between Goyt’s Moss and Whaley Bridge was known as “one of the loveliest in Derbyshire”, and hugely popular with tourists visiting the nearby spa town of Buxton. 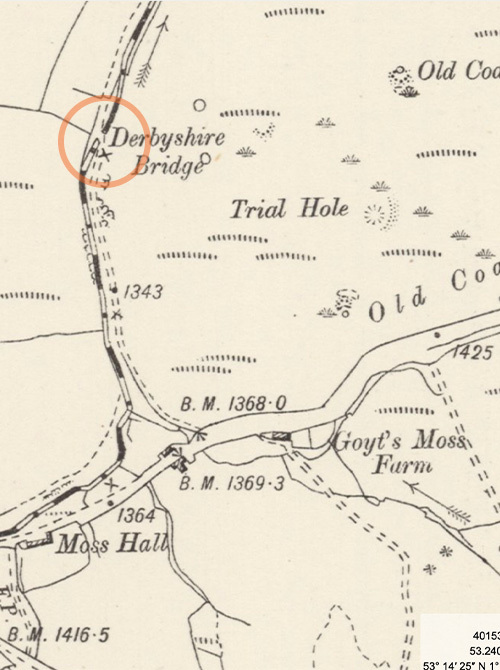 Above: I’ve circled Derbyshire Bridge on this 1890s map. Goyt’s Moss lies to the south (click to enlarge). Goyt’s Moss Farm is the only building to survive. Today it serves as the Peak District Ranger Centre, standing beside the small car park. I’m not sure why the area around the small car park at the southern end of the Goyt Valley is now called Derbyshire Bridge. In previous times it had always been known as Goyt’s Moss. It must have been changed shortly after Stockport Corporation purchased the land in 1930 to construct the twin reservoirs further to the north, when three fairly substantial houses here were demolished, and the fourth left derelict. Derbyshire Bridge spans the Goyt just a short distance along the narrow road towards the reservoirs. The river marks the boundary between Derbyshire and Cheshire. Which is how the bridge earned its name.